Be the First get to know our new product and PROMO. L-Arginine is one of the most potent neutraceuticals ever discovered. In addition to its beneficial effects on the blood circulation, l-arginine has been shown to have positive impacts on immune function, weight concerns and aging. As an adaptogen, l-arginine helps the body adapt to changes in life, the environment, and may increase stamina and sports performance. 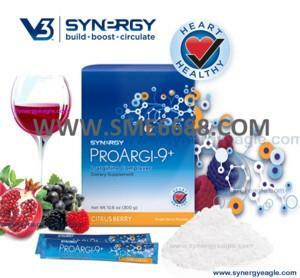 In light of these findings, Synergy WorldWide is proud to introduce ProArgi-9 Plus, a remarkable product that contains l-arginine and other powerful ingredients that work in unison to enhance health and fitness. ProArgi-9 Plus was formulated in collaboration with leading l-arginine researchers such as J. Joseph Prendergast and other cardiovascular specialists who have conducted pioneering research in the proper application of l-arginine for cardiovascular support. ProArgi-9 Plus combines the latest technology and superior ingredients to help boost energy levels and enhance overall health. • Enhances blood flow to vital organs. • Sweetened with Xylitol to enhance oral health. • Great tasting citrus grape flavor. • May aid in decresing body fat. • May boost energy level. L-arginine. L-arginine is a vital amino acid that plays a role in a number of physiological functions in the body, but is best known for its cardiovascular benefits. In the body, l-arginine is converted to nitric oxide, which relaxes the blood vessels and regulates blood vessel tone and flexibility. This reduces stress on the heart and improves circulation. Folic Acid, Vitamins B6 and B12. These ingredients work together to naturally decrease homocysteine levels. Grape skin extract. This ingredient is high in antioxidants, anthocyanins, and polyphenols, which help fight damage caused by free radicals. Vitamin D3. This vitamin has long been known to aid in calcium absorption, but new research shows that D3 also plays a role in healthy cardiovascular function and supports healthy inflammatory response. Xylitol. This ingredient is a low glycemic sweetener that occurs naturally in the body. Unlike other sweeteners, xylitol has been shown to promote saliva production providing protection against tooth decay. Penghantaran produk kesemua negeri di Malaysia iaitu Johor, Kedah, Kelantan, Melaka, Negeri Sembilan, Pahang, Perlis, Pulau Pinang, Selangor, Kuala Lumpur,Terengganu, Sabah & Sarawak.